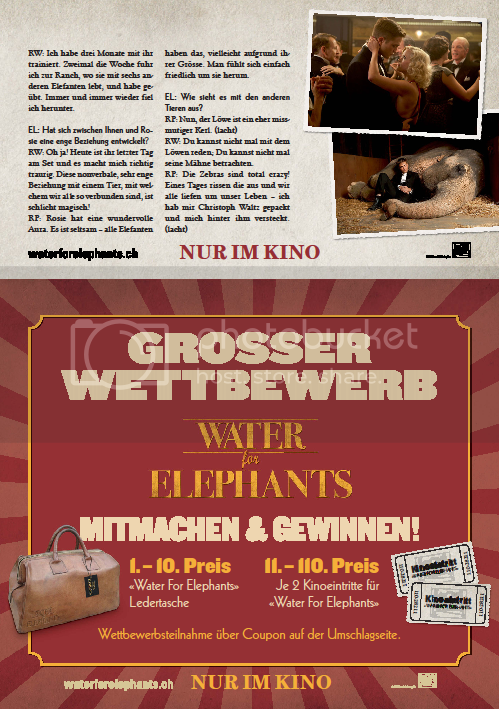 "Water For Elephants" tells from the magical love which changes two people despite every objection and holds a lifetime. In the sophisticated screen adaption of Sara Gruen's same-named bestseller, a past era becomes vivid again and a circus to a loction of dramatic incidents. Towards the end of the shooting, Oscar winner Reese Witherspoon ("Walk The Line") and "Twilight"-Star Robert Pattinson were available for a short interview on set with the British journalist Elaine Lipworth. Elaine Lipworth: Reese, could you describe Marlena's journey? It looks like a wonderful role you're playing. Reese Witherspoon: She's fantastic. I am overhappy that I've got the role of Marlena. It really is an experience playing a woman, who experiences such an interesting journey throughout the whole movie - from a by violence scarred relationship up to the eventual release and new hope in her life. And I must add (laughs), I know this might sound fluffy: But even just the glamour of everything is so fascinating, the costumes and the entire set...! EL: What type of woman is Marlena? RW: She's a very interesting girl. She's got a strong survival instinct and works with an unbelievable strictness to be THE attraction in the circus. EL: How would you describe Jacob, Robert? Robert Pattinson: The circus world is entirely unknown to him. At the beginning of the story he knows exactly who he is and what he wants. But he notices that the world he gets roped into threatens the idealism in him. In a way the story tells about Jacob, who comes face to face with so many exertions and challenges - and at the end of the day he realizes that he can still be an idealist. 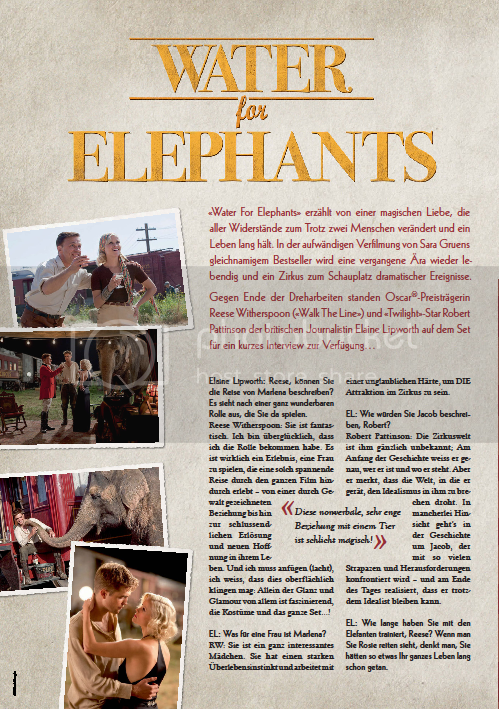 EL: How long have you practised with the elephant, Reese? When we see you and Rosie riding, we think you've been doing this for a lifetime. RW: I've practised with her for three months. I drove twice a week to the ranch where she lives with six other elephants and practised with her. Again and yet again I fell off her back. EL: Have you developed a close relationship betweet you and Rosie? RW: Oh yes! Today's her last day on set and it makes me really sad. This nonverbal, very close relationship with an animal we're all connected with, is simply magical. RP: Rosie has got a wonderful aura. It's strange - all elephants have got this, perhapy because of their size. You're just so comfortable around them. EL: What about the other animals? RW: You can't even speak with the lion. You can't even look at his thatch. Interview is not new, just shortened and a bit changed, e.g. Reese grabbed Christoph to hide behind him, and not Rob LOL (thanks PattinsonLadies for the headsup! ), you can read an extended version of this interview here.